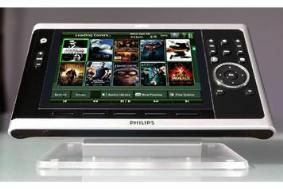 New Philips Pronto software controls Imerge media servers | What Hi-Fi? The module provides a bespoke interface for the flagship TSU9800 and TSU9600 Pronto controllers, ensuring full compatibility with Imerge's range of audio and video servers. Based on Philips's ProntoScript platform, the new module will control Imerge's SoundServer S3000, MediaServer MS5000 and MediaServer MS1. It will also control Imerge's XiVALink3 control protocol. Users can set up audio and video libraries, browse by artwork/track/album/artist/genre etc, build playlists and play queues, keyword search and transmit metadata and full artwork over a wi-fi network. The Imerge Pronto module is available free of charge to Imerge users who buy a compatible Philips Pronto controller.